The New World Order is Fast Approaching! This is in response to fear of the future and the fear I have heard from my friends concerning the intent of their government. Face it kids, The future is bleak. We are weakened from within, much like 1984, that which is good is bad and that which is evil is good. Spin is king. The king has no clothes but no one is caring. Free speech is gagged and propaganda is spewed by every major news agency as if it were truth. Either we go along with the rest or stand with our friends and families against what ever ill wind blows. As for organization, That will come easily enough. I have a feeling that what happens next will be historic. I for one will not be herded into a cattle car or fenced behind razor wire. Believe you me, a dull spoon can do a lot of damage in the right hands. I do not advocate violence of any kind. I have no fear of it either. I advocate strict adherence to the United States Constitution. Period. After peaceful, non-violent, pacifist alternatives have been exhausted, I will decide a course of action that is best for myself, family and friends. I will defend myself, family, friends and country against all enemies, foreign and domestic. Period. And like the 300. . . Molon Labe!!! Undeclared War’ on Mexican Border!!! (CNSNews.com) – The violence along the U.S.-Mexico border is the biggest threat to the nation’s security, members of the House Appropriations Subcommittee on Homeland Security said at back-to-back hearings on Tuesday. “You’re on the front lines of an undeclared war unlike any we’ve ever seen on the southern border probably since 1916,” Culberson said, referring to Brig. Gen. John J. Pershing's expedition into Mexico with 10,000 troops in an effort to capture the infamous revolutionary Pancho Villa after Villa had conducted attacks inside the United States. “I think we are at the point today that we need to send the Black Jack Pershing into the Southern United States and put it in command of a true, fast-reaction military force that can move up and down that border on the U.S. side,” Culberson said. “We are in a state of undeclared war on the southern border that has already spilled over [into the United States], and it’s utterly unrealistic to think that it hasn’t,” he said. This is my opinion. If it isn't true. . . . What is the dang deal??? If the Government's plan is to stop this, it would have been stopped long ago. It is clearly not the government's agenda. Think it through. McCain sounds; and for that matter, the silent majority aka: the GOP sounds, the same as Obysmal with only a few nuances of difference. Sure there is the occasional hand wringing and hyperbole with much colorful rhetoric but it is the shame. . . oops, I mean same crapola different day. A serious problem like the lack of defense of our border is so obvious that it can't be misunderstood. It can only be spun or ignored. Today, the least of my worries have to do with illegal aliens, guns or drugs. We create the Department of Homeland Security and their mandate is to secure the homeland. So why the blind eye to the North and South. I want to be secure and free from the worry of nuclear attack. I don't feel that way now. I am far less worried about North Korea or Iran than I am about some Islamic fundamentalist. extremist, terrorist with a suitcase or backpack nuke. The object with those in power now does not appear to be to stop the incursions but rather encourage them. If this were not so, the greatest military power in all of history would have no problem closing down the boarder. This boarder could be shut down like a slamming door if the word were given. The questions should not be why; by now, with the liberal agenda at hand and the slide of the right towards center left, should be obvious. This is part of a grand plan by those in power. Maybe not all but by those who count. Boarder incursions have been going on for far to long and under the noses of to many administrations for it not to be sanctioned. Not about the drugs, though, it is a nice side benefit for those acronyms profiting by it. Not about the Illegals either. It is about the New World Order. The One World. Pure fantasy, yes I know. Oh. . . This is a shocker. Who'd a thunk? Former inspector general Gerald Walpin has accused President Obama of firing him without the 30-day notification required by law for his investigation into the alleged misuse of federal grants by Sacramento Mayor Kevin Johnson. Conspiracy Theories are born of such things. The Obysmal, CBS, DNC Cabal in action. This is the fourth large billboard company to say that "you" do not have the right to free speech. This has left the realm of "It's my company and I'll do what I please" and has entered into; "Yes sir, what ever you say sir." This is a concerted effort to stifle free speech. By who? Obysmal? The government? Rogue Democrats, HehHeh? WASHINGTON – A fourth billboard company has rejected a campaign designed to raise visibility on questions surrounding Barack Obama's eligibility for office – this time by claiming the Outdoor Advertising Association of America, a trade and lobbying group that claims to promote freedom of speech, actually discouraged acceptance. At least one billboard company, Steen Advertising, backed out of a commitment to lease billboards to WND after a sales executive said the company was warned off the campaign by the OAAA. How do you like your pablum fed to you? How palatable is this? THIS IS SO INCREDIBLY WELL PUT AND I CAN HARDLY BELIEVE IT'S BY A YOUNG PERSON, A STUDENT!!! effortlessly divide other assets since both sides have such distinct and disparate tastes. We don't like redistributive taxes so you can keep them. You are welcome to the liberal judges and the ACLU. Since you hate guns and war, we'll take our firearms, the cops, the NRA and the military. You can keep Oprah, Michael Moore and Rosie O'Donnell (You are, however, responsible for finding a bio-diesel vehicle big enough to move all three of them). We'll keep the capitalism, greedy corporations, pharmaceutical companies, Wal-Mart and Wall Street. You can have your beloved homeless, homeboys, hippies and illegal aliens. We'll keep the hot Alaskan hockey moms, greedy CEO's and rednecks. We'll keep the Bibles and give you NBC and Hollywood ..
You can make nice with Iran and Palestine and we'll retain the right to invade and hammer places that threaten us..
You can have the peaceniks and war protesters. When our allies or our way of life are under assault, we'll help provide them security. We'll keep the SUVs, pickup trucks and over sized luxury cars. You can take every Subaru station wagon you can find. You can give everyone health care if you can find any practicing doctors. We'll continue to believe health care is a luxury and not a right. And we won't have to press 1 for English. A moment of silence. . . .
We have just watched a bid for freedom and liberty crushed by a fascist, Islamic theocratic republic. The republic part is in consideration of the "honest" elections for their President who is nothing more than a mouth piece for the brutal Islamic regime in power now. These people stand on the same hollowed ground as those in Tiananmen Square, June 1989 and Lexington and Concord on that fateful day in April 1775. Now add this date June 2009. The struggle for Freedom and liberty is the same in every country and every language. I suggest a moment of silence in respect for those who died this week in their struggle to be free of the shackles of fascism and brutal theocracy. The High and Might Be. . . . Her Honor, Barbie Boxer. . . .
has aptly demonstrated her arrogant liberal underpinnings. Shocked and awed that a decorated serviceman; a brigadier general in the United States Army, A man in charge of more lives and square footage than Barbie will ever get a grasp of, had the audacity to refer to her in a gender specific title! This uncouth ruffian had the unmitigated gall to call her. . . are you ready, yes the horrible word is coming, he called her Ma'am! He referred to the men as sir and to Ms. Boxer as Ma'am! Oh the horror! Perhaps this elected official felt denigrated. Maybe she felt disenfranchised. Possibly felt her cronies back home would find this term demeaning. I really don't know but I do know that she is an elected servicewoman. She needs a tad bit of humility when standing in the company of a man who has offered his very life in service of this country. Respect and dignity are earned and perhaps she should be apprised of this too. She clearly does not understand what happened as she is stubbornly refusing to apologize for her incredibly poor behavior. But in every other corner of the United States, when she is compared to someone like Walsh–someone who has actually accomplished things in a competitive environment, Boxer comes off as a pretentious, paranoid, pathetic woman who clings to the trappings of power like a bloated piglet, sucking desperately at the teat of political authority. The RIAA is a dinosaur that has not heard it is extinct. The RIAA has in one fell swoop, done more damage to the music industry than all the previous file sharers put together. This legal decision is a huge miscarriage of justice and has turned more than one against the RIAA and the music industry as a whole. This is a slap in the face of anyone who ever was or is a fan of a musician or band. These bands and musicians as well as the RIAA get their money directly from you. Are you all drones, especially those under twenty. Do you have the cojones to say no. Not now, not ever?! These people are leeches, bleeding you dry. Like drones, you continue to buy their music, make them rich and you poor. Then they have the audacity to take your money and sue you or those you know with it. Parasites like these will continue to do these vile deeds until you stop them by not giving them your money any more. No more money. Bury them. Do something decent for a change. Do the right thing. For you, your friends and this woman who has been viciously attacked and victimized by the RIAA. This settlement is absurd. People, people, people do something now. Make it known that you, the ones with the money, the real power here, will not take this disingenuous, cold hearted, mean spirited behavior from the RIAA any longer. Stand for something now. Do it now. Make your feelings known! P.S. My hat's off to any attorney who picks up this woman's appeal pro bono. She deserves much better legal protection. Is the RIAA out of their collective minds. Is the RIAA out of their collective minds? I think, yes. And what about the jurors who thought 1.9 million was an appropriate settlement for downloading and file sharing 24; yes, you read that right, 24 songs. I'm sorry but maybe $240.32 plus tax but 1.9 million to the Recording Industry Association of America? This is not ridiculous. This is a tragedy of biblical proportion for the young lady who has been victimized by the RIAA. The size of this settlement is un-Constitutional. Akin to debtors prison. They sued her under Gang Laws. Never intended to be used to attack a young woman over 24 songs. First, a simple, "would you please stop" is good. Then a "Hey, cut that out." but this is beyond belief. I am a fan of country music, a listener of radio, a buyer of CDs. I tell you what though, I stopped purchasing any music from the Dixie Chicks after their, disloyal, un-American rant and will never again purchase their music. Period. It still irritates me enough to change the channel when I hear them on the radio or see them on TV. The deal here though is not about the sweet, innocent young lady they have assaulted with this. Her character does not matter one iota to me. This is about what the RIAA thinks is right. They think it is right to stomp on, pound on, pummel you into the ground to scare the rest of you. This is about strong arming a person in order to SCARE the rest of you sheep CD buyers and sharers into stopping your “horrible” actions. Maybe the RIAA should be sued under the RICO statutes. Especially their lead counsel. Could be an in here. That being said, I have decided that I can no longer support; in any way shape or form, such a morally bankrupt and corrupt organization as the RIAA. I can do without the RIAA, and ANY of their member performers/musicians ever again. Their incredibly ill considered actions leave a sour, bad taste in my mouth. To see this organization, heavy with funds from their member performers, pummel this woman into the ground over this very trivial and non- issue matter is disheartening. I say trivial and non- issue because so many bands are now independently airing their music free or free to try online. More and more, they embrace the new world while the RIAA is mired in a dark, dank and control freak past. They can stuff their line of thought right up their collective asses as far as I am concerned. I encourage the rest of you who are outraged at their morally bankrupt actions to stop buying music. Period. They did this to this girl with your money. How does that make you feel? And to the jury in this case, what were you thinking. Are you people out of your collective minds here? I had more to say but this is a family blog. SHAME ON YOU! I've got more but should cool down before I write anything else. Can you say Boycott any RIAA connected media. Whew! P.S. The performers who stood by silently while this happened should be ashamed of themselves too. What were you thinking? Oh yeah, it's a great idea, lets pound on some poor girl who loves our music so much she wants to share it. Lets scare the rest of our fans to the point they don't want to buy our music anymore. Oh yeah, there be some brain workin' goin' on there. Right? Breaking News: We have received word that U.S. Customs & Border Protection has DENIED the numerous requests for extension that it had received and is planning to stick with the June 21 deadline for comments. CBP's denial of an extension seems to be a clear indication that they do not intend to act in a fair and reasonable manner on this issue and have already made their decision to go ahead. That means we have to set the stage for the next act, which will likely be conducted both in court and in Congress. The battle is far from over, your comments will play a role in both efforts. U.S. Customs & Border Protection (CBP) has proposed revoking earlier rulings that assisted opening knives are not switchblades. The proposed new rule would not only outlaw assisted opening knives, its broad definition of a switchblade would also include one-handed opening knives and could be easily interpreted to cover most other pocket knives, even simple old-fashioned slip-joints. Note that CBP's interpretation of the Federal Switchblade Act forms the basis for national, state and even local law and judicial rulings in many cases. This ruling by CBP is NOT limited to just imports. This WILL affect virtually everyone who carries a pocket knife, no matter the type! Download the 63 page CBP document and read it for yourself. Knife Rights has sent a letter to CBP requesting an extension to the ridiculously short 30-day comment period. We need your help to make an impression on CBP. They figured that they could slip this by everyone with little notice. We need to let CBP know that they are not going to get away with it; that we noticed and we are not happy and that we will not stand by while they take away our pocket knives. We are in for the fight of our lives. We need you to write CBP NOW! Click here for a Model Letter you can send to CBP. However, the reality is that CBP isn't required to listen to our demands, but they do have to answer to Congress. After you send a letter to CBP, giving them notice they are not going to sneak this by us, the next step is to inundate Congress with emails and letters. If you want to be free to carry your pocket knives in the future, you need to write your Senators and Representative TODAY! Click here for a Model Letter you can send to Members of Congress. We have also prepared a Communicating with Congress page that includes tips to maximize the effect of your letters. This page was developed after consultation with experts who understand exactly how to get your message across to Members of Congress. We have also included easy links to find your Representatives, if you don't know who they are or the best way to reach them. How much of an impact your communication has can be significantly impacted by how and what you write. Our aim is to help maximize your impact so your Members of Congress actually listen and do something. PLEASE, take a few minutes to review our Communicating with Congress page BEFORE you act. 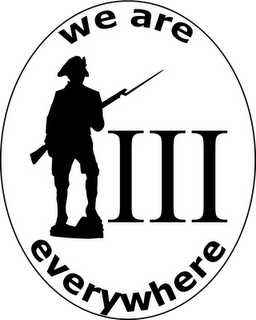 Knife Rights was formed three years ago because we knew it was only a matter of time before something like this would happen that would threaten to take away our right to own and carry our knives. Well, that time is now and we're working to help keep our essential tools and essential rights. We cannot do it without your help. Knife Rights is only as powerful as the forces we can bring to bear. You are the only truly effective weapon we have. Policitcans only listen to voters. NOW IS YOUR TIME TO ACT! Because you are sending a hard copy letter and emails via Members' web forms, we won't know you did it unless you let us know. It is critical that we be able to know how many have responded, so please click here to send us an email (customs@Kniferights.org) to let us know you've sent the letter and emails. Join Knife Rights and help support the fight to keep your Knife Rights! Milwaukee Top Cop Spits on US Constitution! My letter to the Mayor. I am stunned. I am a citizen of the State of Wisconsin and a patriot. I hold Wisconsin's and The USA's Constitution as sacred. Being politically active, I am completely incredulous at the silence from you over your Police Chief's statements concerning citizens rights. I feel duty bound to contact you regarding the recent public remarks stated by Chief Ed Flynn concerning the open carry of firearms. To quote Chief Flynn, “My message to my troops is if you see anybody carrying a gun on the streets of Milwaukee, we’ll put them on the ground, take the gun away and then decide whether you have a right to carry it.” What?!? I cannot believe a public official would say something that goes so squarely against both the Wisconsin Constitution and the US Constitution. Plainly, Mayor Barrett, this man should be terminated immediately from his position before his offhand remarks sully your reputation and have a negative impact on your political future. These callus remarks simply indicate Chief Flynn’s true sentiments concerning the constitutional rights of all American citizens. He obviously holds them in disdain. I am truly concerned for the citizens of Milwaukee and the State of Wisconsin, It does puzzles me as to how the fine city of Milwaukee, and of course your honor, can tolerate such an contemptuous fascist statement from its “top cop”. This so called "Top Cop" is demonstrating willful disobedience to the Constitutions of both the State of Wisconsin and the United States of America. Do the right thing Your Honor, remove Chief Flynn. David Letterman; Incredibly Out of Touch. This Letterman thing is a good example of how the most crass and rude behavior has become acceptable to those who surround themselves with yes-men and women in Hollyweird and the media in general. Oh Yeah, framing innocent young women as promiscuous or raped, Now that's funny as hell right? When did that become funny? This is to far and Letterman has gone to far. He has always tried to be edgy but this is not edgy. Just plain rude, crude and lewd. Possibly illegal if referring to a fourteen year old girl. Letterman, get a life. If you think your joke was funny, maybe you should not be around your own child. What you think is funny, the rest of America thinks is sick. This casts you in a whole new light or should I say a very dark and ugly shadow. First, you need to sincerely apologize. Period, no jokes, no insincerity. Then you need to fire whomever counseled you that this was OK. Then you need to consider retiring as well. Your time has come and gone. No, I am not surprised . . . .
No, I am not surprised at the actions of these liberal dupes. CBS, Lamar and now Clear Channel. What I am is surprised at the tepid, apathetic response from those who are not liberals. From those who claim to be right of center. The acceptance of actions like these simply embolden the opposition to take more and more liberties with your rights and freedoms. The question that I have is when do you stop taking it on the chin and start doing something about it. This billboard thing is not just an inconvenience or a silly little thing that some company has done. This is a concerted effort to bury your First Amendment right to free speech. Billboards, newspapers, TV, radio, Internet advertising. All these enable free speech. None are alike or reach the same audience and if; as in the case of CBS, they choose to say no, that covers all of the above for a certain audience. This is not about billboards or even a birth certificate. It is about Freedom and Liberty. Your Freedom and Liberty. It does not taste very good to have my plate of Freedom and Liberty Yanked out from in front of me. I don't appreciate the likes of Dan Rather and his ilk having a say as to what I should be able to say or not say. I also do not appreciate those I consider compatriots taking 5 on this one. What happened here is actually historic in nature. Three of the largest media advertisers in the world have just told you "NO! ", you cannot use our venue for your political means. Your political views, if you hold to these, are being censored, slapped down, blanked out and all I hear is a whimper. The worst of it is this is not the only issue that is being treated this way by the right. Why are we acting like lambs to the slaughter instead of sheep dogs defending the flock? What I cannot figure out for the life of me is where in the heck is the outrage. I mean come on now. In my humble opinion, this is a clear effort; on SOMEONE'S behalf, to control what you think. How does this square with the First Amendment? I get the part about business's having the right to say what goes on their billboards. But I suspect there is something illegal and certainly un-ethical and immoral about colluding to hide illegal activities of a controversial nature. What's going on here is not right. These companies can bluster about their rights all they want but this is a scary precedent to set with far reaching ramifications. CBS Bans "Where's the Birth Certificate" Billboards. 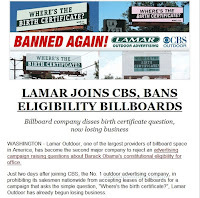 In a move reminiscent of a fascist regime in what must be a fading memory for most Americans Ostriches, CBS the Communist Broadcasting Network, has banned the "Where's the Birth Certificate" Billboards nationwide. This may be their right to do so but it is censorship and it is troubling that General Electric; like some great potentate, can determine what you may or may not read. Even on a billboard. Or perhaps especially on a billboard. Media (mind) control by Obysmal is so apparent that it is appalling to all but the Kool-Aid Drinking followers of the Madssiah. What else are they not telling your or how twisted is their reporting. How deep does the rabbit hole go. I think a ban of CBS and General Electric is in order. If it says GE on the label, I leave it in the store. As for CBS, just remember the knife in your back when watching any of the CBS affiliates below. Just say no to CBS and all their sponsors. I do.